CUSCO Part# 660-477-A. This fits the GC8, GF8, BC5 and BF5 per the label. It should also fit the GM5 Impreza coupe, BD and BG Legacy models. It will also fit the BE and BH Legacy, but reportedly hangs very low, perhpas lower than on earlier models. "Lower Arm Bar? What is that?" This is probably the first thing that came to mind when i was told about this part, and probably what you're thinking right now. 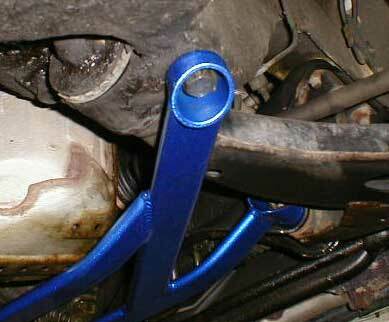 The lower arm bar is one of many structural enhancements that can be made to the Legacy and Impreza. It's widely used in Japan, where i purchased it on vacation, but almost unheard of in the US. This will probably change soon. The bar is basically the closest equivalent of a strut tower bar for the bottom of the car. What it does, in a nutshell, is brace the a-arms from both sides of the car with each other and the chassis. This reduces the tendency of these areas to flex under load, which apparently can be severe in the early model Legacies. I have seen a very similar version of this part by JIC at SEMA 01 and an excellent variant bracing only the arms but using pillow balls, from Prova of Japan. My general impressions of the part are that it's effective. The changes are subtle, but appreciated. The tendency for the car to waddle at speed in turns is nearly eliminated. Keep in mind, i have a very stiff suspension and a good compliment of braces already, but this part did make a difference. 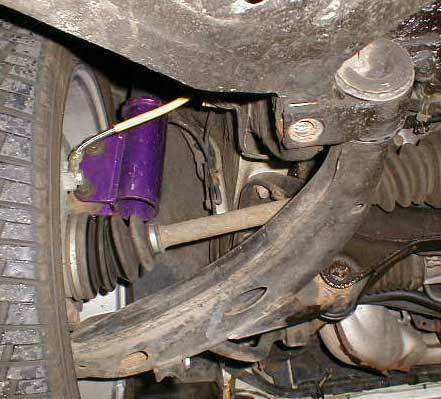 Another possible benefit is keeping camber accurate through hard cornering, a very good thing indeed. Ok, Install is a breeze with pneumatic tools and a lift. 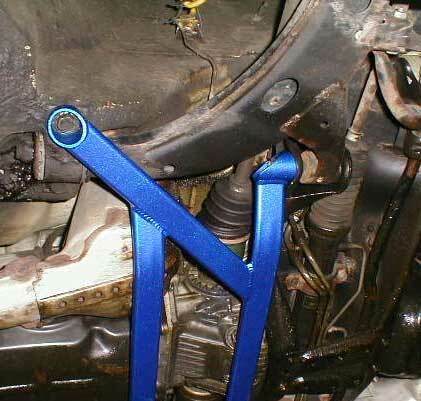 If you're trying this in your garage with a jack, you might consider paying a place $20-40 to install it, as it'll be much easier for them to use the right tools and setup. 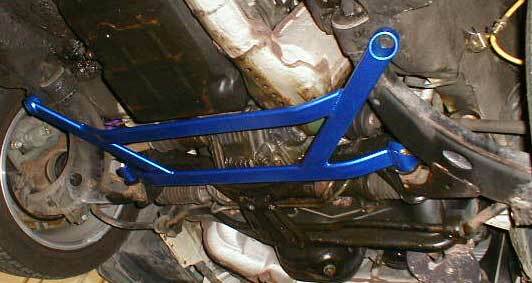 The bar did come with two new bolts for the front pivot, as the brace ads a little to the length of the assembly.